Wonder of wonder, miracle of miracles! I'm finished both of C's dresses! We're headed into Vernon this weekend so I can do a final fitting with her and hem the bottoms but other than that - dishes are done dudes! I used the bodice of Simplicity 2250 - Cynthia Rowley and then modified a vintage pencil skirt pattern I had in my stash for the bottom. I think the dress turned out pretty well; the reds aren't 100% the same but I think it's pretty darn close. She can always wear a wide belt to help separate the colours (and add a chic touch while she's at it) and that should solve the problem. The second dress I've created for C has sort of a vintage U.S. Marine pin-up vibe to it... So I'll call it the Marine Pin-Up Dress! Don't ask me how I come up with these ideas... I blame it on being brain-dead from all the packing I've been doing lately! Back view (close up) - check out that invisible zipper! Oh man, I look sooooo awkward in that last photo - ha ha ha! Oh well, tant pis! 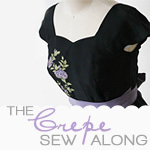 I did another combination of sewing patterns to come up with this little gem. The bodice is based on a vintage McCall's 6081 pattern that I picked up at the thrift store for about $0.10, and the skirt is based on Simplicity 3673. Since I found the McCall's pattern at the thrift store, it was a size too big so I had to grade the bodice down a size. It actually was pretty straightforward and was very easy to make! I used a red Asian floral satin fabric given to me by my husband's grandmother and then lined the bodice with a white cotton voile I had in my stash. Since C lives in Vernon, summers can be so friggin' hot and nothing shows sweat like satin, I knew that I had to line it with something to help keep her cool. Unfortunately you can see a bit of the white around the edges if you move your arms around, but I didn't have any red cotton on hand and the white helps the colours to pop better than if I'd used black to line it. The skirt is made of a navy stretch cotton twill that I had in my stash. I also added a couple of fun nautical navy buttons on the shoulders since lots of the inspiration dresses C showed me had cute little button details on them. It all came together rather nicely if I do say so myself. The hem might look a little odd in these photos, but I have just loosely pinned it since I need her to try the dresses on first before I hem them for realz... She's a good 3-4" shorter than me. Hopefully C can send me some pics of her wearing the dresses later this month while she's on vacation in South Padre, Texas. Seriously, I've never heard of this place before in my entire life, suddenly in the past 2 months I have three friends who have been / are going to this place! It looks amazing (judging by the photos). I'm sure she'll have a great time, and look sassy while she's there in her new dresses! Hope you all have a sassy day! 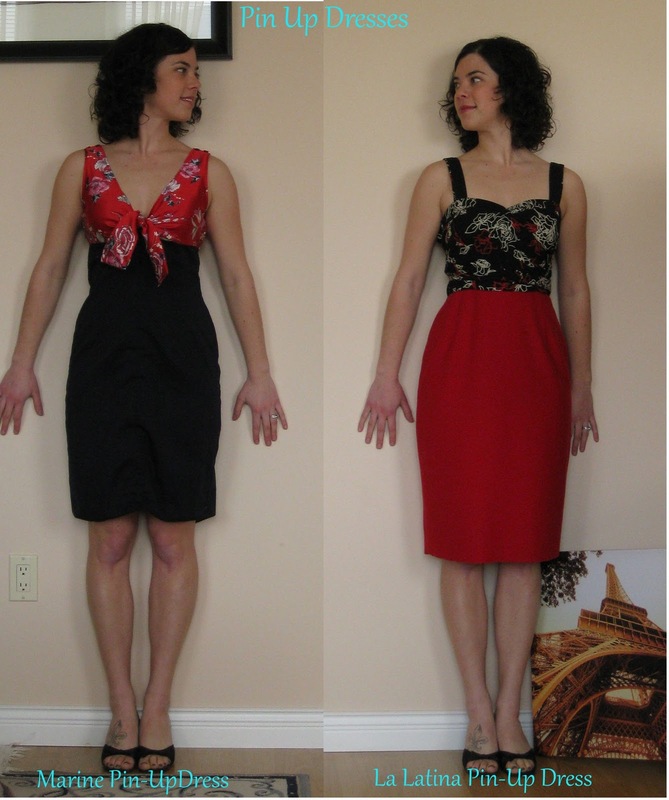 i love both of the dresses you made! im always a big fan of two tone dresses that looks like you are wearing a top and a skirt, but actually they are connected. Thank you so much! You are a sewist (and blogger) that I greatly admire... So I really appreciate your comment! Congratulations on your baby girl, I wish you all the best in motherhood! Lovely dresses, both of them!